Sick and tired of your job? Here are some options for you if you feel like switching industries. Online job portal CareerCast came up with a list of the top jobs for 2012 based on factors such as work environment, stress, physical demands and hiring outlook. 200 jobs were ranked according to results of surveys conducted. Given the tumultuous global economy and recent boom in social media, it's not surprising which jobs are among the top 10 for 2012. Software engineering is considered the top job of 2012, with actuary work coming in second. Jobs like human resource manager and occupational therapist also made the list. According to CareerCast, these jobs have great pay, good working environments and demand for these skills is high. 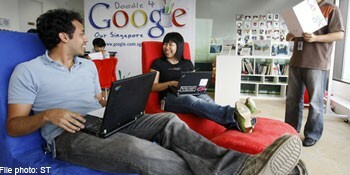 Find out which are the 10 best jobs for 2012. Quoted figures are salaries in the US. Analysing figures and tackling sums can have pretty high returns. Mathematicians apply mathematical theories and formulas to teach or solve problems in a business, educational, or industrial climate. Computer systems analysts plan and develop computer systems for businesses and scientific institutions. The job has climbed up four ranks to number nine. The Online advertising manager is a new entrant on the "Best Jobs" list. The recent surge of social media and other Internet start-ups, as well as companies going online has things going for the online advertising industry. Helping people in health-related fields pay off too. Ranked at number seven after a 10-rung climb up the ladder, occupational therapists help emotionally, physically, mentally or developmentally impaired patients achieve full self-reliance. The second health-related career on this list, audiologists help to treat and diagnose patients with hearing-related problems. Financial planners apparently have strong hiring outlooks due to their expertise in portfolio management and assisting individuals in managing and planning their financial future. They aren't dentists, but they assist dentists in diagnostic and therapeutic aspects of a group or private dental practice. Number four on the list, dental hygienists have climbed up six rungs from their previous number 10 position. Planning, directing, and/or coordinating all human resource activities and staff of an organisation makes for a strong hiring outlook for human resources manager. Actuaries have the second best job in the world, CareerCast said. Apparently, determining the probabilities of accidents, sickness, and death, and loss of property from theft and natural disasters do not detract from their good working environment and strong hiring outlook. It moves up one spot to number two. The explosion of social media, e-commerce and online news aggregation site may be behind the number one job in the world. Software engineering remains at the top spot for two years in a row. CareerCast said software engineering also has few physical demands and minimal stress. It also has a good working environment and a strong hiring outlook. Also, find out which are the 10 worst jobs of 2012 here.